In September 1945, the British military government built a camp in Friedland, south of Göttingen, near the American (Hesse) and Soviet occupation (Thuringia) zones. The camp was designed as the first way station for refugees, evacuees, and returning soldiers. Starting in 1947, the camp was administered by the federal state of Lower Saxony. During the period of mass expulsions from 1944 to 1945, the camp offered services to large waves of refugees. Thereafter, it functioned primarily as a way station for German (or ethnic German) emigrants from Eastern bloc countries, especially from Poland, Romania, and the Soviet Union. 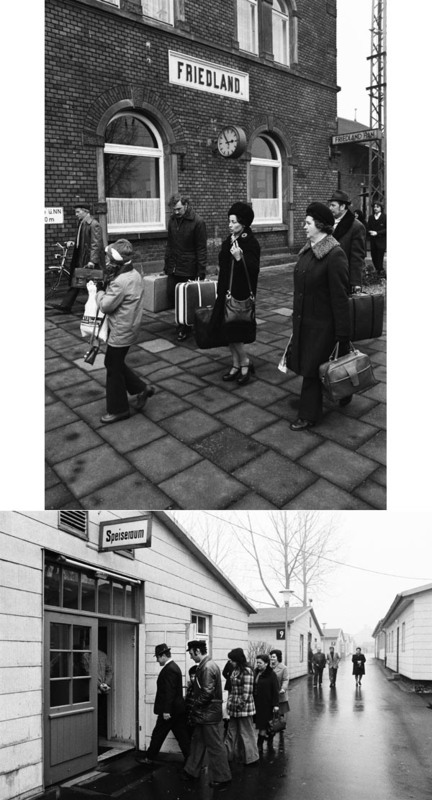 Between 1950 and 1987, approximately 1.4 million people of German extraction came to the Federal Republic from the East; more than 60% of these emigrants came from Poland. Photos by Ulrich Wienke.